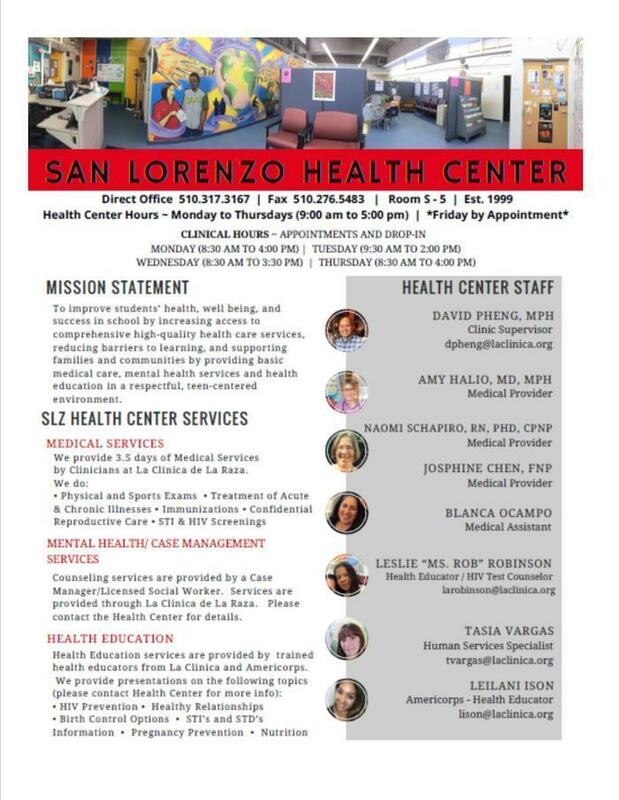 In addition to providing a free, safe and convenient place for students to receive medical and mental health care, the San Lorenzo High Health Center offers many services to SLZ Unified students and other patients ages 12-21. One of our major goals is to create healthier communities by providing basic medical care, mental health services and health education to students, their families, and others in the community. All services (for SLZ Unified students and patients age 12-21) are by appointment only. To schedule an appointment please call 510-317-3167. Sensitive services medical care provided to SLZ unified students and Royal Sunset graduates until age 21 (based on availability of appointments). Referrals for free and low cost family counseling and support. Assistance in applying for Healthy Families and MediCal Insurance. Information on and assistance with completing state and county aid applications. Need Resources? Please make sure to fill this out and bring it to the Health Center!